This is the day - 3 of my visit to Goa where we explored one of the pristine beaches of South Goa and savored authentic Goan cuisine. If you haven't read previous day post then do check it out as well. Woke up at 9.30 in the morning and the only motivation to get up was the complimentary breakfast which closes by 10. After breakfast, we got ready and checked out at 11.30 am. We kept our luggage in the storeroom and decided to visit Betalbatim beach which is just half km from our stay. 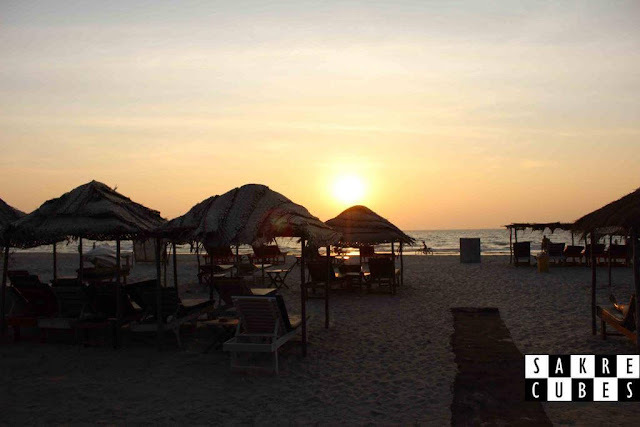 Betalbatim Beach: If you just want to relax while in Goa, put up your feet in a sunbed, enjoy your continental and Konkani food, and drinks, then Betalbatim is the beach for you. Unlike most Goa beaches that are lined up with palm trees, this beach has numerous pine trees along the shoreline. 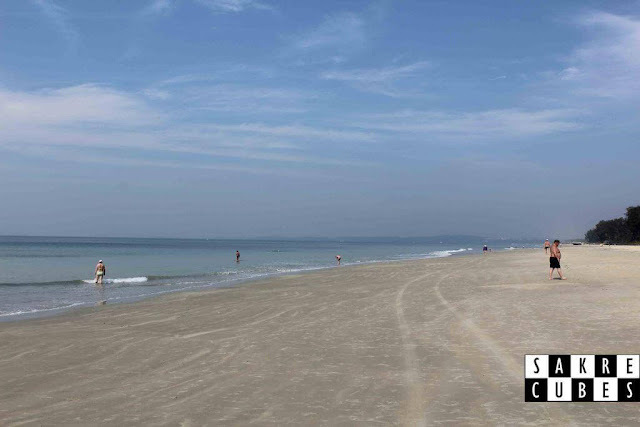 Betalbatim is known for its clean golden sand and beautiful surroundings. Tourists who prefer quieter beaches often choose Betalbatim over its more crowded neighbor, Colva. 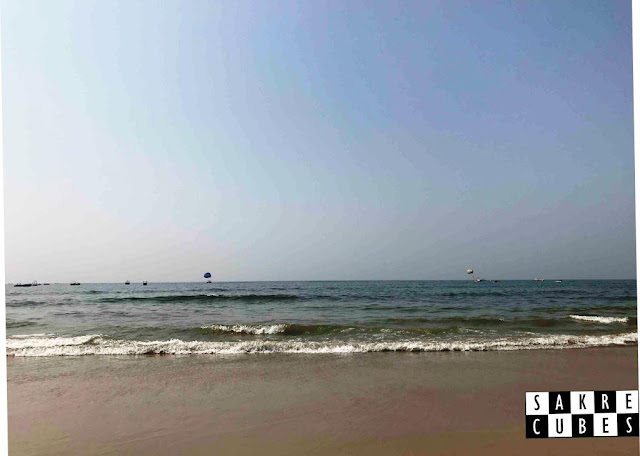 The beach gently slopes down to the Arabian Sea so it's safe for swimming but we were not prepared to get into the water. Clean golden sand beach with zero thrash. 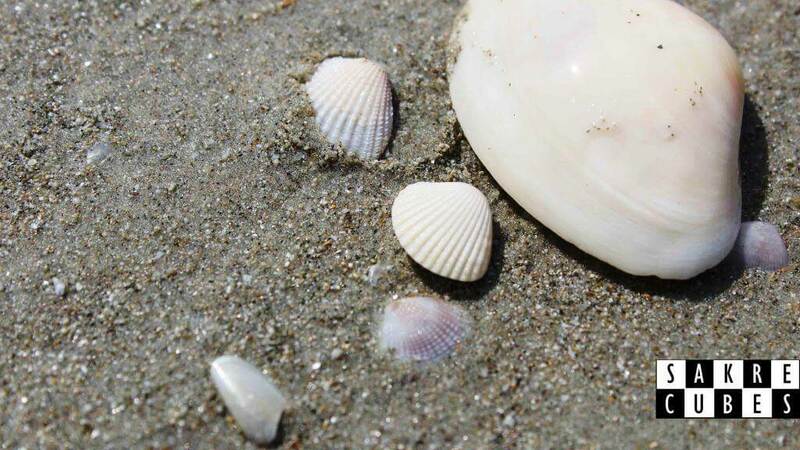 Collecting seashells is the most interesting thing to do at beach. 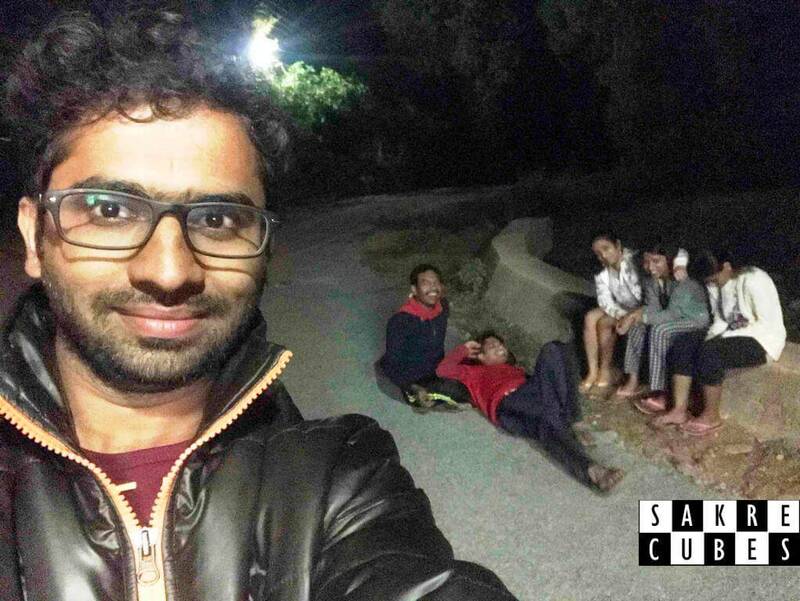 Kids take group selfies but only legends put their DSLR on a tripod and take a group pic. We did spend some time doing a photoshoot until 1 pm. 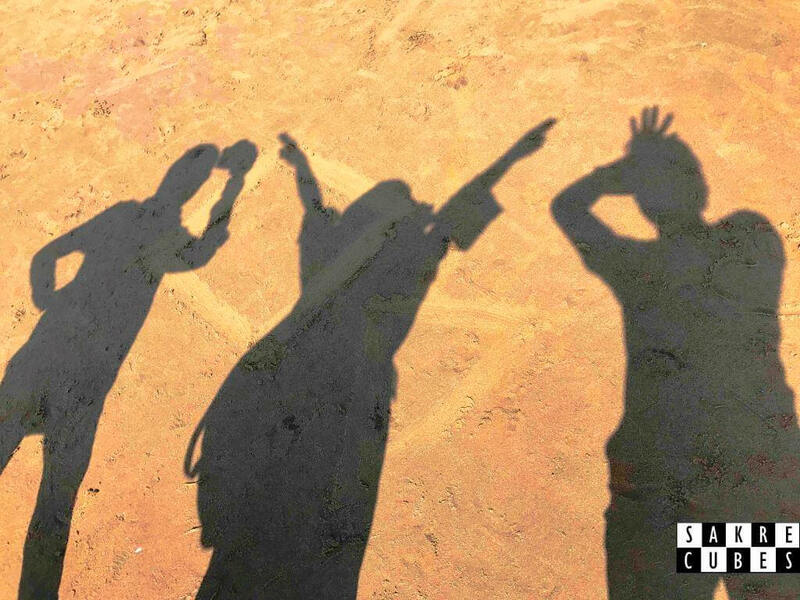 It was extremely sunny and hot. 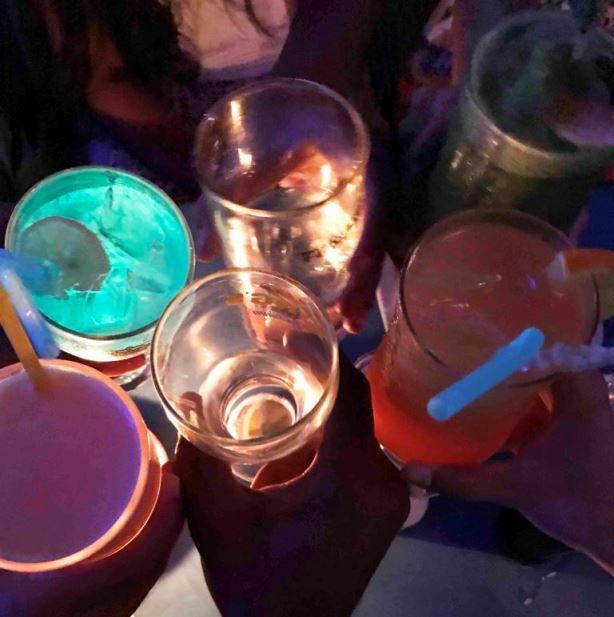 We had plans to visit a couple of places but because it was extremely hot we decided to visit a restaurant and go out only after 4 pm. At this point, we realized that the best thing to do in Goa in the afternoon time is to stay home and explore beaches either in the morning or in the evening. 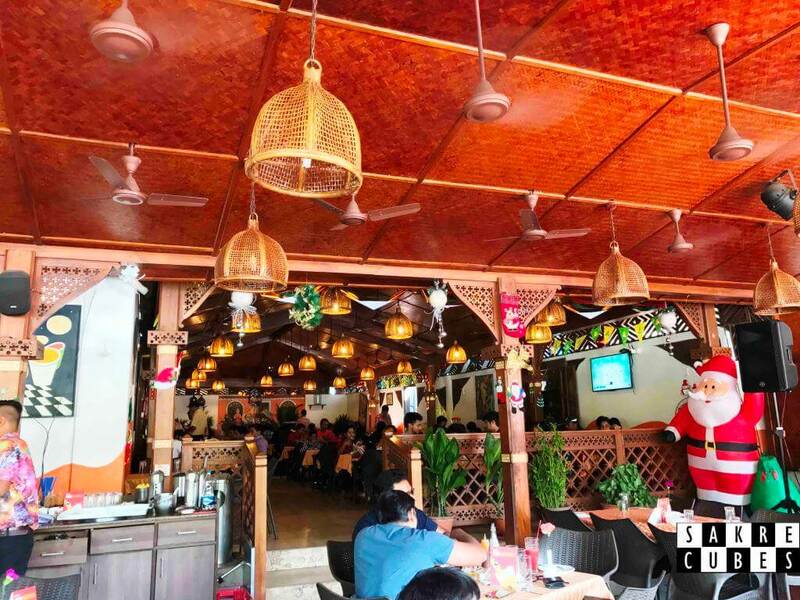 Dex had this amazing restaurant in mind called Martin's corner which is a great place to relish Goan cuisine and seafood. Martin's corner: This is a famous family-run restaurant which grew out of a small shop that was set up with four tables about 20 years ago. Pleasant retro music and the aroma of Goan cooking filled the air. 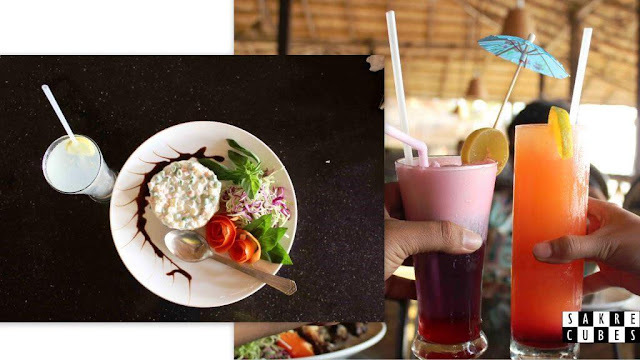 We savored authentic Goan seafood which tickled our taste buds. A must visit place if you are visiting the South Goa. After a scrumptious lunch, we returned to the hotel to collect our luggage at 4 pm. 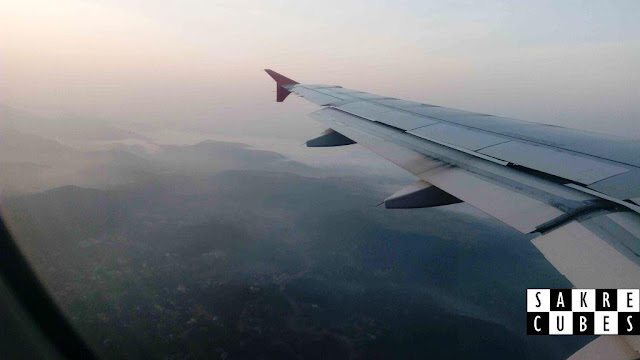 Our flight was at 9.50 pm, we had around 5 hours left to explore the Goa. 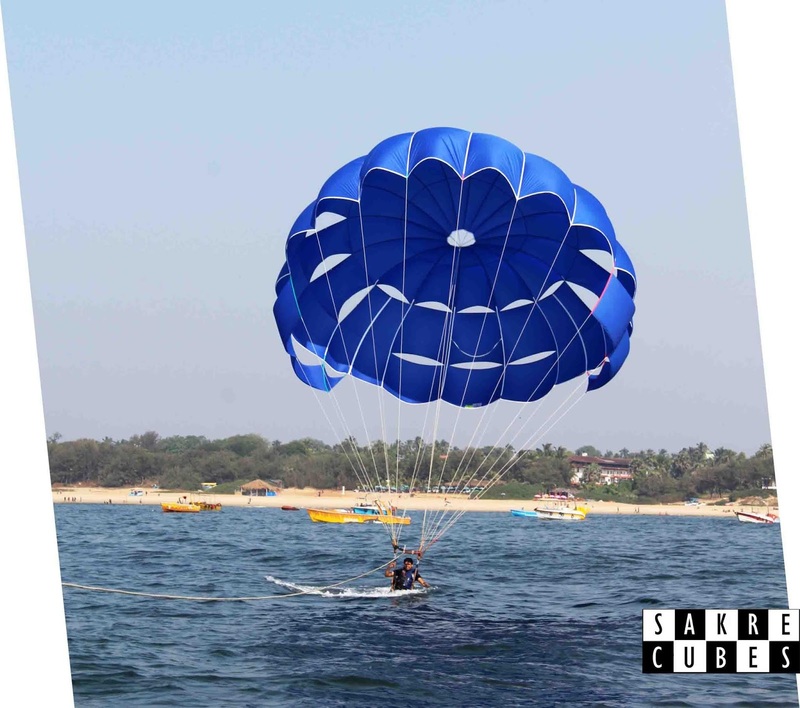 The best plan was to visit the attractions near the central Goa so that we would be roaming close to the airport. 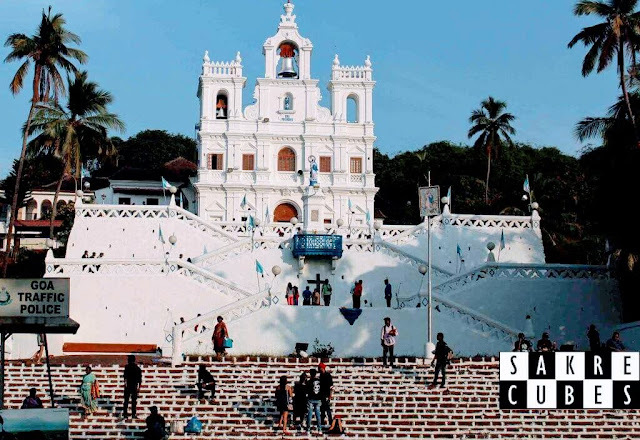 Churches of Goa: There are a countless number of churches in Goa among them Our Lady of the Immaculate Conception in Panjim is one of the most famous church. The double flights of steps that zigzag across the hillside gives it a distinctive appearance. True to its name, the facade of this church is painted an immaculate, sparkling white. The church is so much photogenic that it has been featured in numerous movies and TV shows. Can you remember which all movies were shot at this location? There are many casinos on the cruises just opposite to this church. Since none of us had any knowledge about gambling, we stayed away from it. 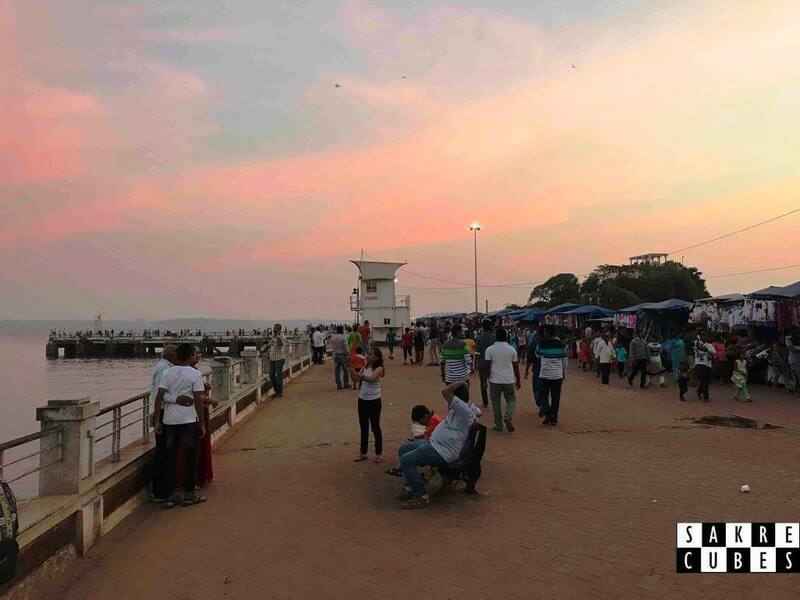 After this, we decided to visit Dona Paula which became very famous after the movie Singam. Dona Paula: Dona Paula is frequented by the locals and tourists. It was extremely crowded and chaotic. It is a one-time visit kind of place and even if you miss it, it's ok.
After spending 10 minutes we headed back to the airport at 8 pm. Called up the bike rental guy who collected the bikes back and gave back the original documents which we had deposited for security. After killing some time outside the airport we boarded the flight and reached Bangalore at 11 pm. Everyone reached our respective home at 12.30 am. 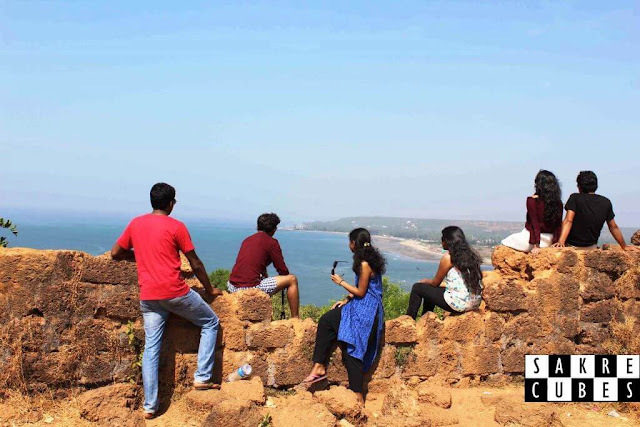 This is the day - 2 of my visit to Goa where we will be visiting Chapora fort and a couple of beautiful beaches. 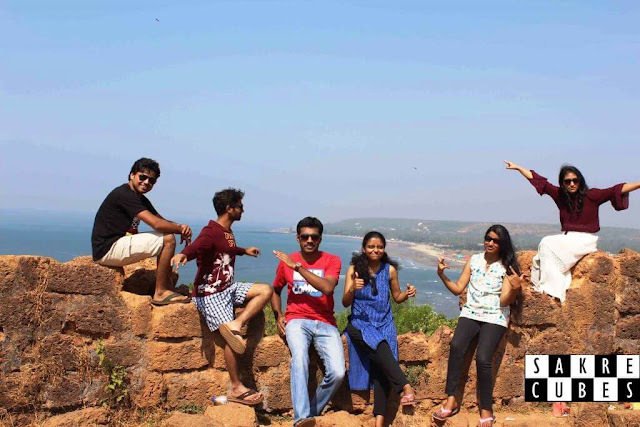 If you haven't read my Goa Day - 1 post then do check it out as well. After partying till 2 am yesterday, no one was ready to get up early in the morning. The only thing which motivated us to wake up was the complimentary breakfast which usually closes by 10 am. The breakfast was average, aloo paratha is not what we south Indians are used to have for the breakfast. The second-day stay was booked in South Goa, so we had to check out from the current hotel. 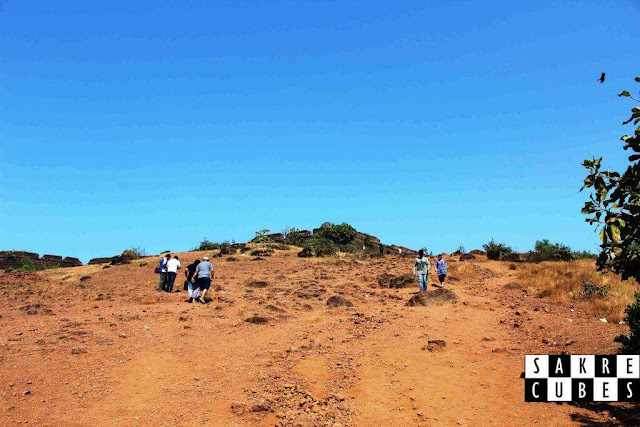 We had few nearby places to be explored so after checkout, we kept the luggage in the storeroom and decided to visit Chapora fort and Vagator beach. 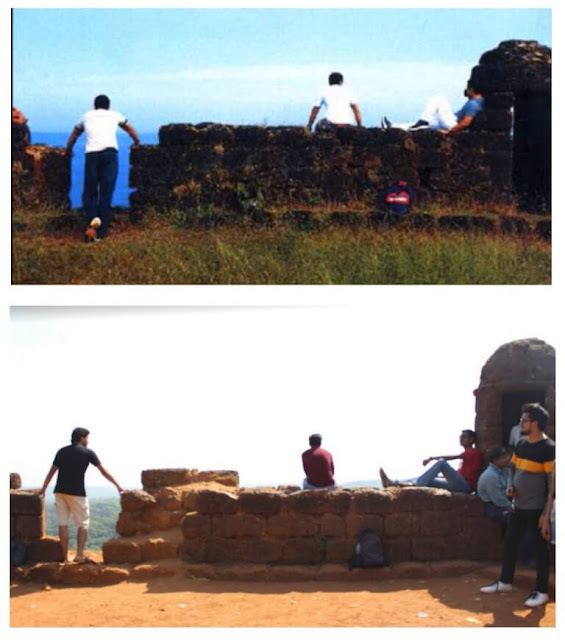 The Dil Chahta Hai Fort: Chapora fort was just another fort until the epic scene of the Hindi movie Dil Chahta Hai was shot here back in 2001. It's surprising to see how deeply indeed Bollywood infiltrates the life of an average Indian, I was no exception either. 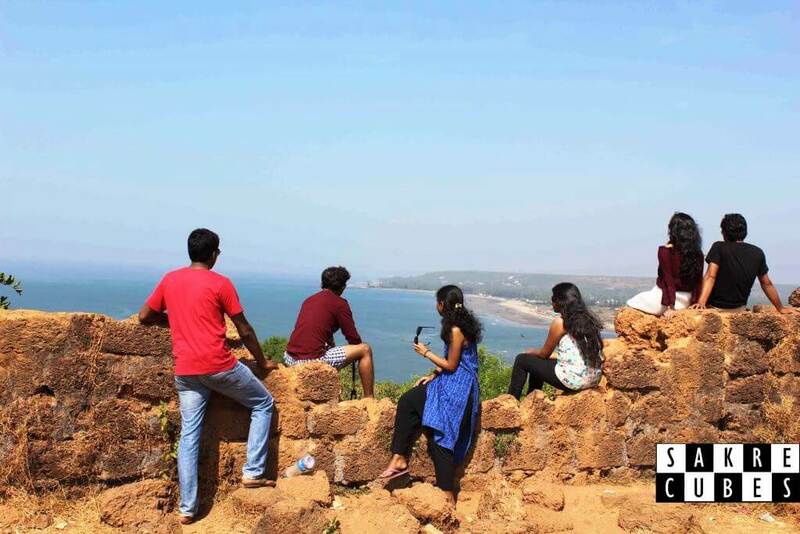 Chapora continues to remain a perfect vantage point for gazing at the sea as the waves gently nudge the shore in silent harmony. Doesn't Morjim Beach look more beautiful from here? Chapora fort was just 5 minutes away from our stay, it was 12 in the afternoon by the time we reached. There were already a lot of bikes in the parking area. This is the only place where we had to pay the parking charges :( Sun was high in the sky and it was burning hot. Even 75 SPF sunscreen lotion gave up at this point. 5 minutes of the short hike took us to the fort. 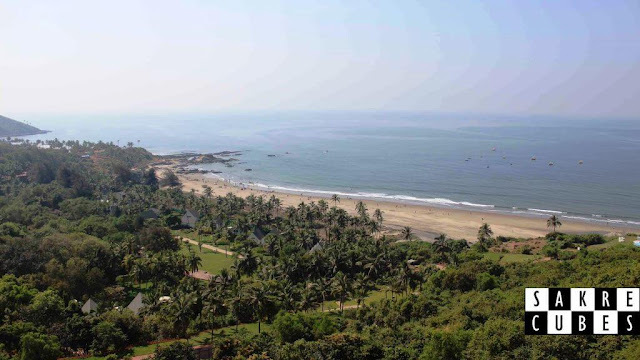 Fort offers a spectacular view of the Vagator beach and Morjim beach. Watching the setting sun from this point would be a magical experience, we had planned to visit this place yesterday itself for sunset but we couldn't manage time. As time passed, the place was flooded with the tourists, somehow we managed to get a good spot for photography. The fort is a great destination for landscape photography and I managed to click pretty amazing shots. 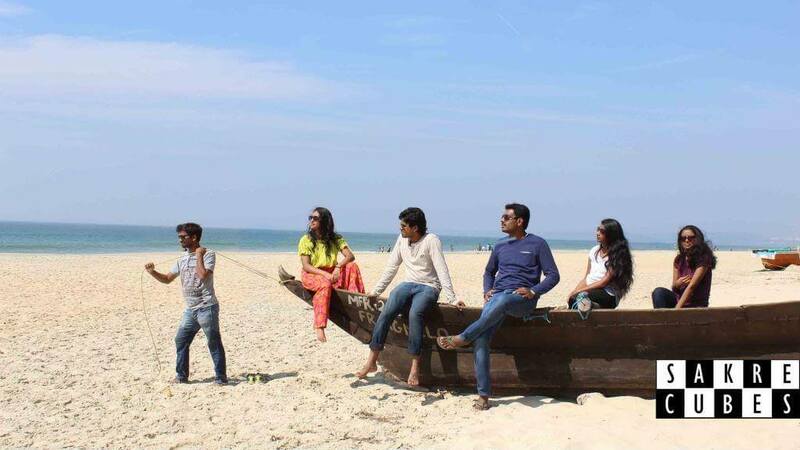 I wanted to recreate the iconic scene of Dil Chahta Hai movie but we were constantly photobombed by the strangers. 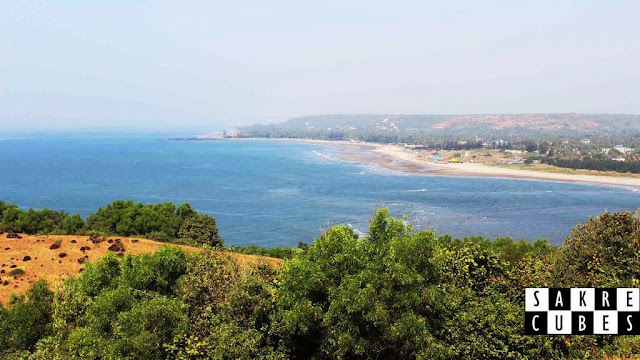 Vagator Beach: After spending close to an hour at the fort, we came to the Vagator beach which is adjacent to the Chapora fort. We were extremely tired and hungry. We wanted to crash down at any shack for the lunch but sadly there were none. Even the beach wasn't as beautiful as the Calangute and Anjuna we visited yesterday. 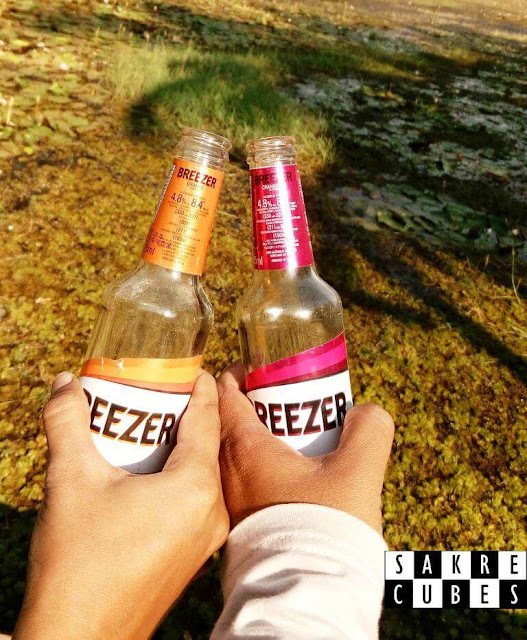 We clicked some amazing slow-motion shots only to realize it was already 3 pm. One hour plan got stretched for 3 hours and we still had Ashwem beach on the bucket list. I googled to see the Ashwem was 13 km to the north from Vagator (the place we were), which means it's in the opposite direction to our hotel in the south. Visiting it would cost us extra 26+ km and consume minimum 2-3 hours. 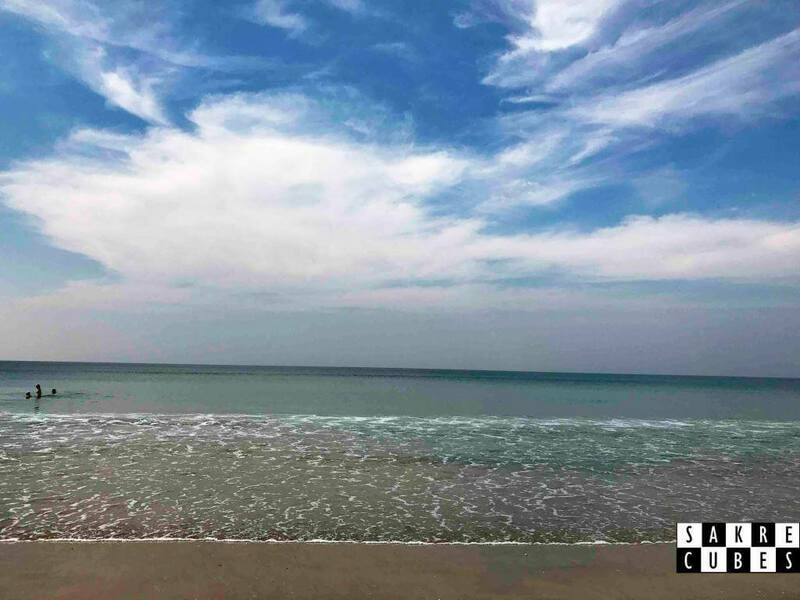 This secluded beach looked irresistible in the photos and we finally decided to visit it. 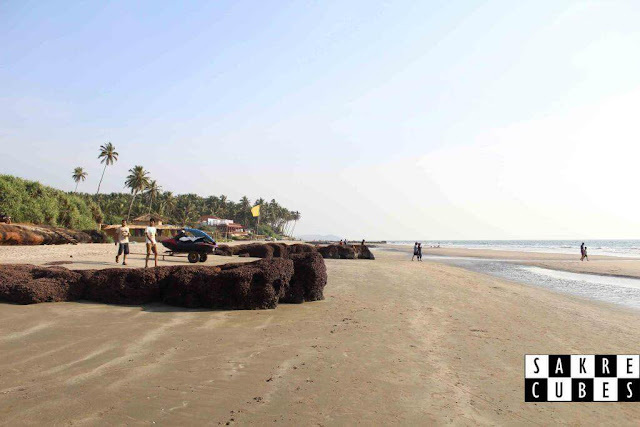 Since there is no traffic in Goa we reached the Ashwem beach in less than half an hour. 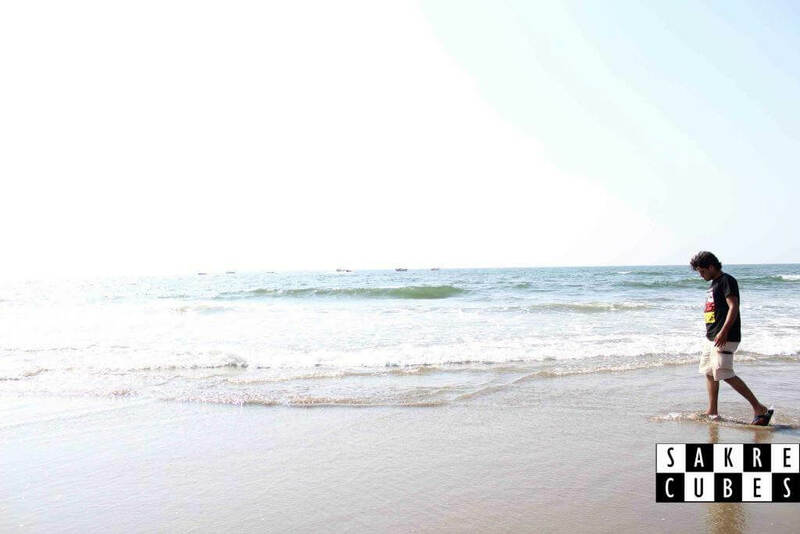 Do you remember this kind of shot from the Dil Chahta Hai movie? 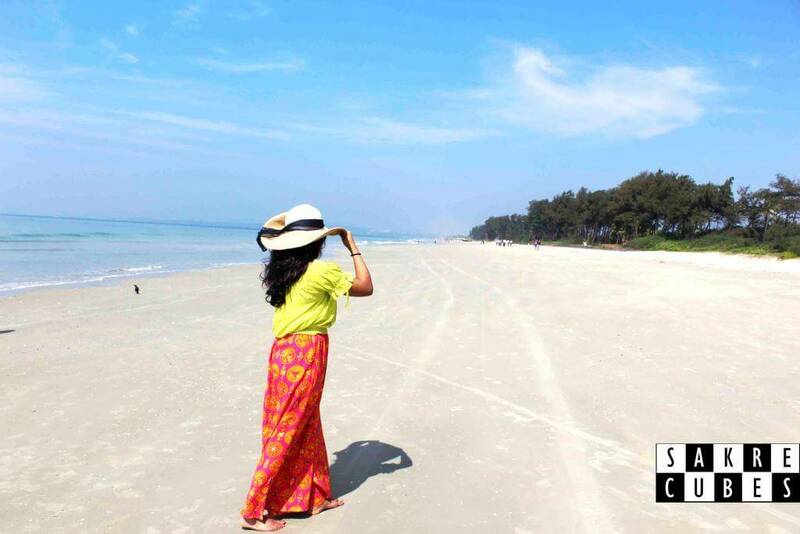 Ashwem Beach: The beauty of the beach unrevealed as soon as we stepped on the white sand. I could hardly observe any crowd except few foreigners taking a sunbath. As we walked on the beach we couldn't be more excited to see the lovely beach with no trash at all. Ashwem has a beautiful scenery known for its rocks all around it carved by the shellfish. 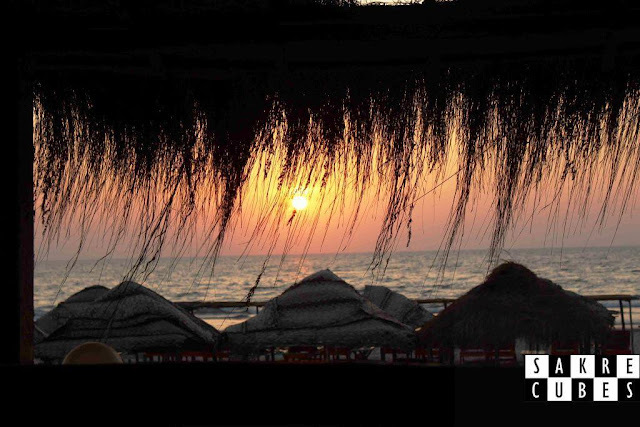 The view that the beach provides is one of the most beautiful sights ever seen. Ashwem isn’t very crowded which only adds to it beauty that would’ve been ruined amidst a large audience. There was a shack on the beach called La'more which served great food. 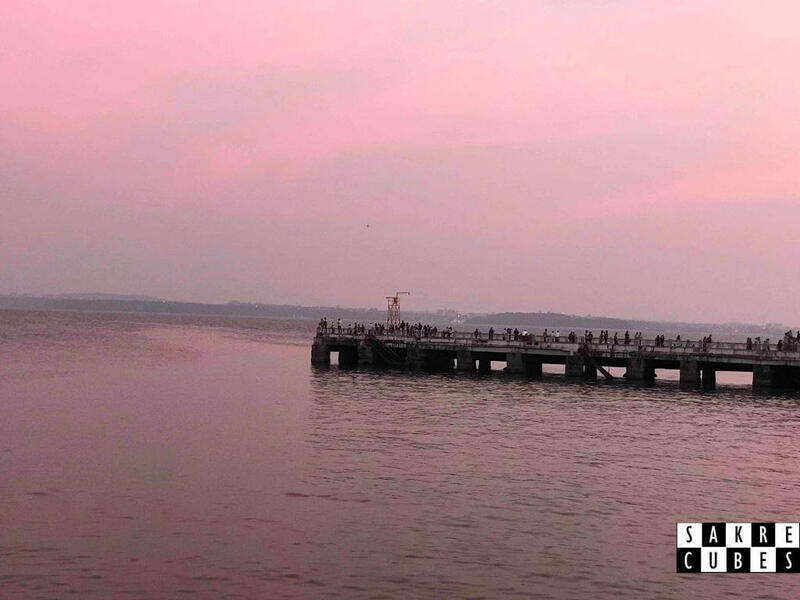 We enjoyed magical sunset right from the restaurant. We spent a few hours until the sunset. Goa would have been incomplete without visiting Ashwem Beach. It was time to leave this beautiful place. 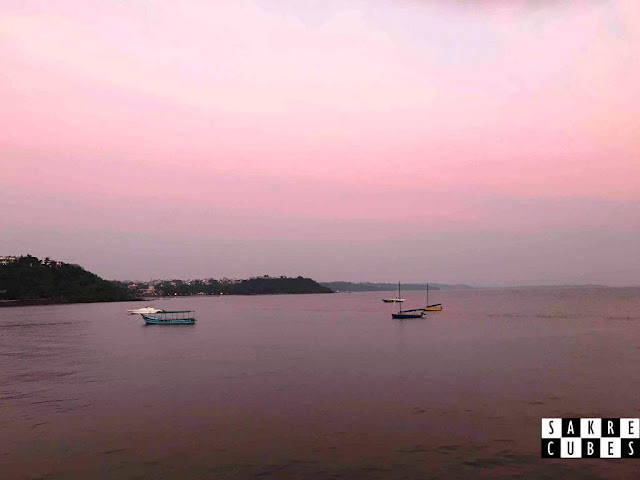 It was already dark and we had to travel close to 60 km to reach our stay in south Goa. Goa is pretty safe to travel in the night no matter if its a busy road or an isolated area. 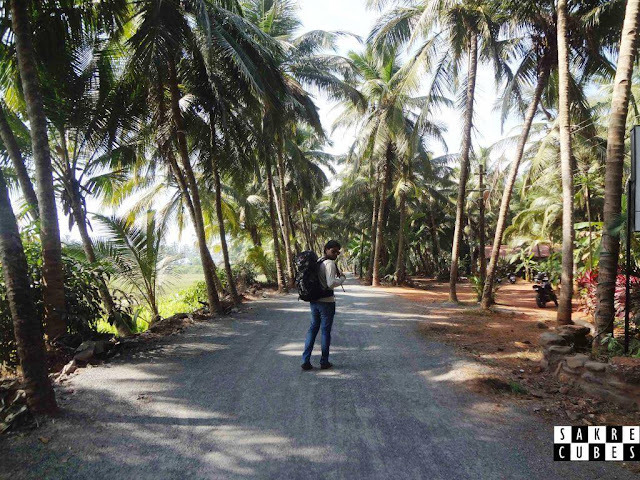 North Goa to South Goa: We collected our luggage and we started riding back at 7 in the evening. GPS guru said it should not take more than an and a half hour. 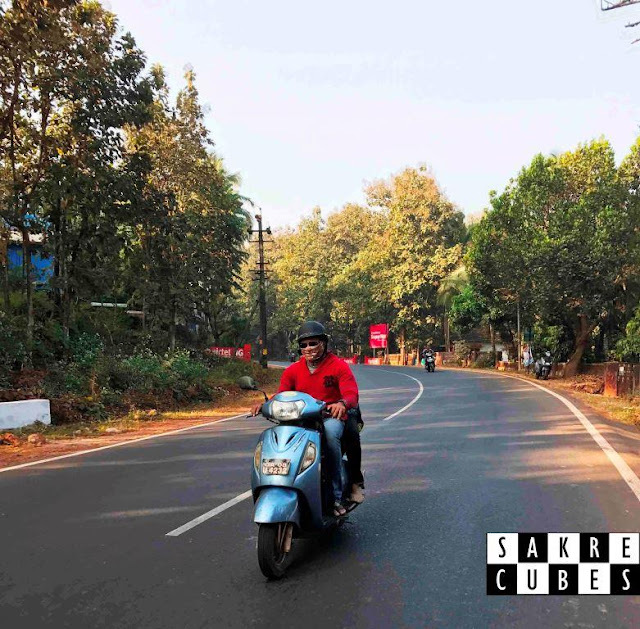 Riding in Goa is always fun as you will be accompanied by beautiful surroundings and zero traffic. 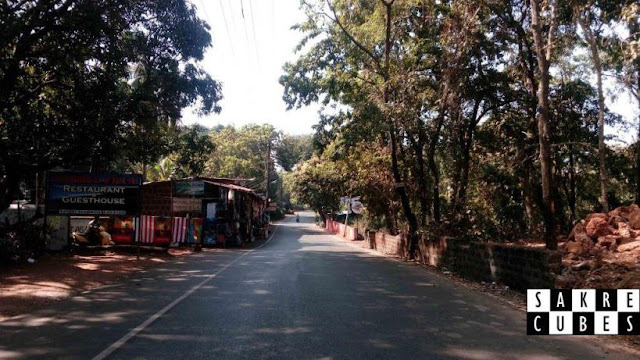 There was a drastic change in lifestyle as soon as we entered South Goa. There are not many pubs, no stupid drunk people on the roads, no tourists, the streets were little spooky though. 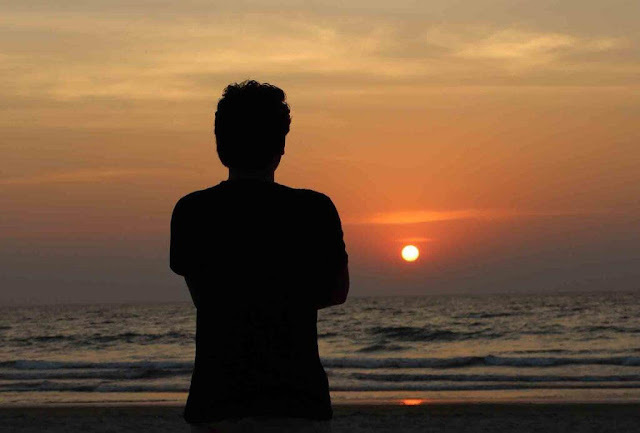 You get peace of mind when you come to South Goa. 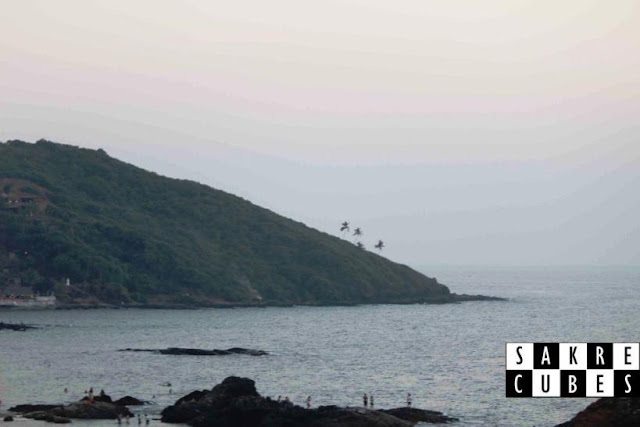 Probably this was the reason why few people who seek serenity visit South Goa rather than the North Goa. Navigation took us straight to the hotel we booked. we checked into the hotel at 9 pm. We could feel how sweet the South Goan people were as compared to the North. The closest beach was just 700 meters so we decided to have dinner at a shack. Upon inquiring we learned Mickey's is a pretty famous shack for food and drinks. After freshening we visited Micky's which was just 2.5 km from our stay. 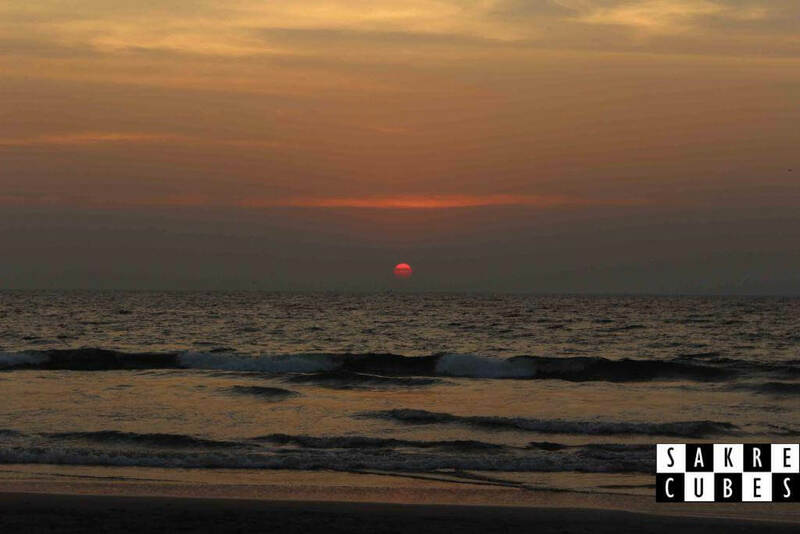 If you have already visited Goa then let me know which part of the Goa you liked the most in the comment section below. Everyone has a group which keeps planning trip to Goa and which keeps canceling. Well, our group wasn't an exception too until we finally made it to Goa on year's hottest time - December. After a lot of planning everyone in the group finally agreed upon a common travel date. 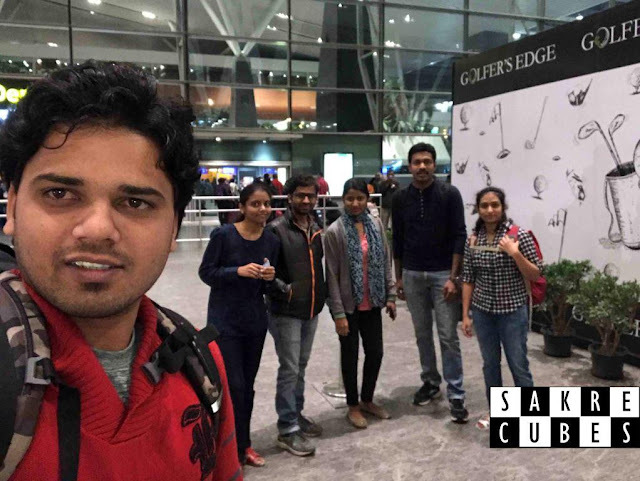 To reduce the dropouts we booked the hotels and flight two months in advance. The Goa trip was going to be expensive so I gave up my other trek plans to compensate for the expenditure. 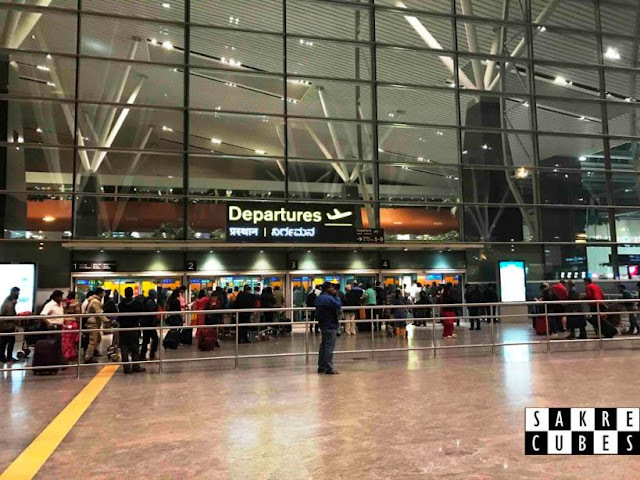 Planning Phase: Booking flights was a difficult task as prices were fluctuating but we managed to book the flight to Goa leaving on Friday morning at 6 and the returning flight on Sunday at 10 pm. 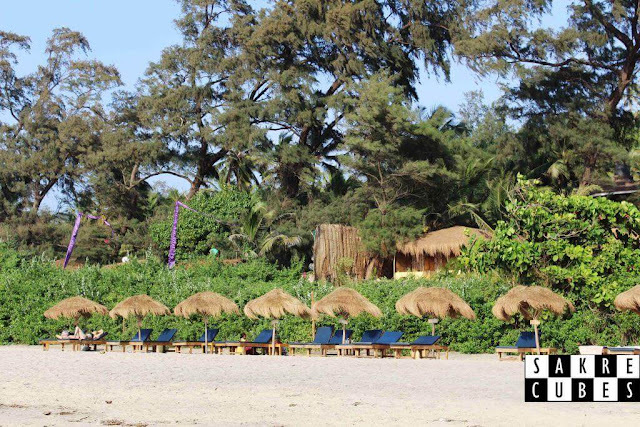 The stays are usually expensive in Goa, especially at this time. So we did quite a bit of research and booked a decent stay through Oyo Rooms. There were few luxury stays by the beach side which were tempting but they were expensive as hell. We had plans to cover both North Goa and South Goa hence we booked the one day stay in North Goa and other in South Goa. We booked OYO 2440 Palm Grove near the Vagator beach at a good deal and other at OYO 5583 Alagoa Resort near Betalbatim South Goa at slightly higher the price. Taxis are very expensive in Goa and public transport is very poor so the most popular way to travel inside Goa is to rent bikes. There are plenty of options for bike rentals. We booked with rentabike who had the pickup and drop facility from Doblin Airport itself. 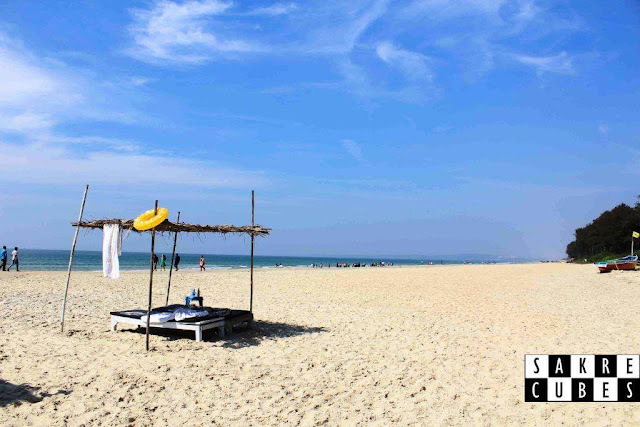 Planning places to visit in Goa was the toughest task but this blog on Quora made our task easy. We learned what places to see, where to eat, what to buy and what to wear as well. Bangalore - Goa: The cab arrived at 4 in the morning. 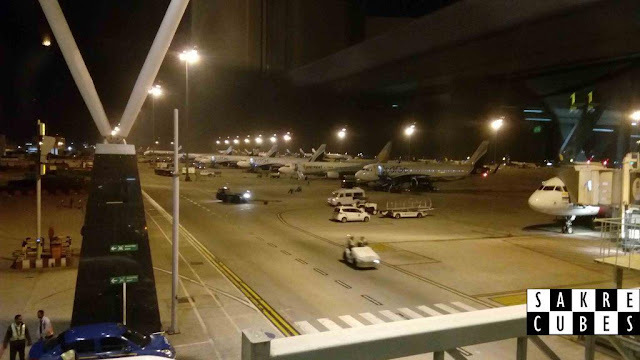 On the way, I picked up everyone and reached the airport in an hour. After security checkup, we started boarding at 5.30 am. It was our first flight so we were very much excited. 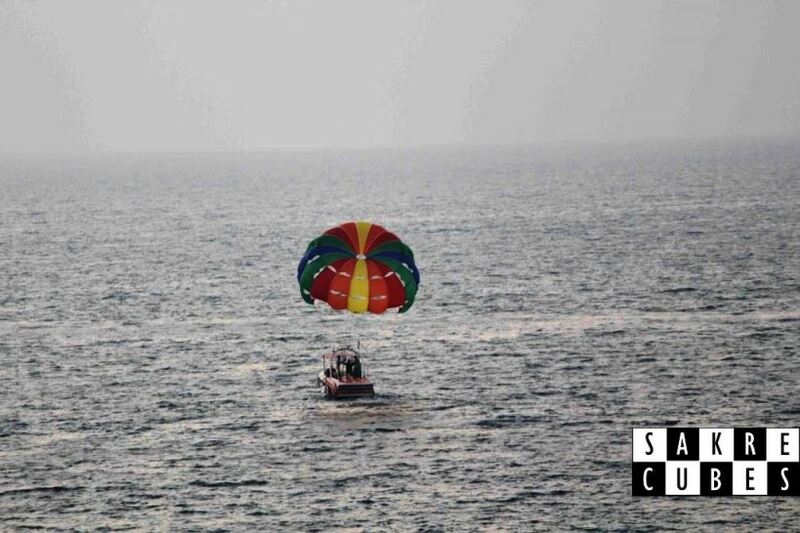 An hour later, we landed in Goa. Goa airport wasn't any better than our Majestic in Bangalore. We came out of the airport and called the bike rental person who made us wait for another 40 minutes :@ (even though we were following up with him from an hour). After giving him original ID card and making full payment, we got three Honda Activa. It was 8.30 in the morning, we had moped in our hand and the Goa journey had officially begun. After fueling up we started navigation to our stay in the North Goa. It was 45 km ride from the airport and expected to reach in an hour. It was 9 in the morning and the climate was pleasant. Beautiful road flanked by trees on one side and Arabian sea on the other was a treat to ride. 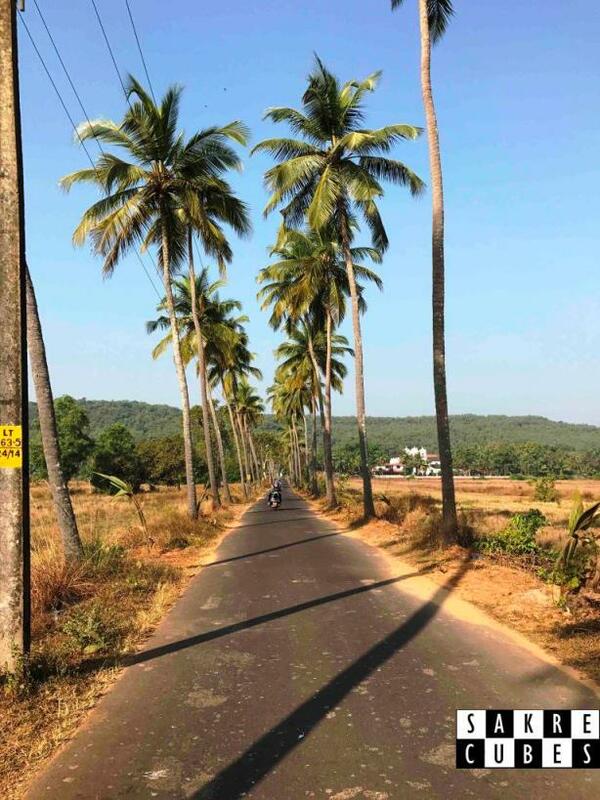 This stretch was probably one of the most beautiful stretches of our entire trip to Goa. We wanted to have breakfast on the way but surprisingly none of the restaurants were open. I wonder if people in Goa actually eat breakfast or not. 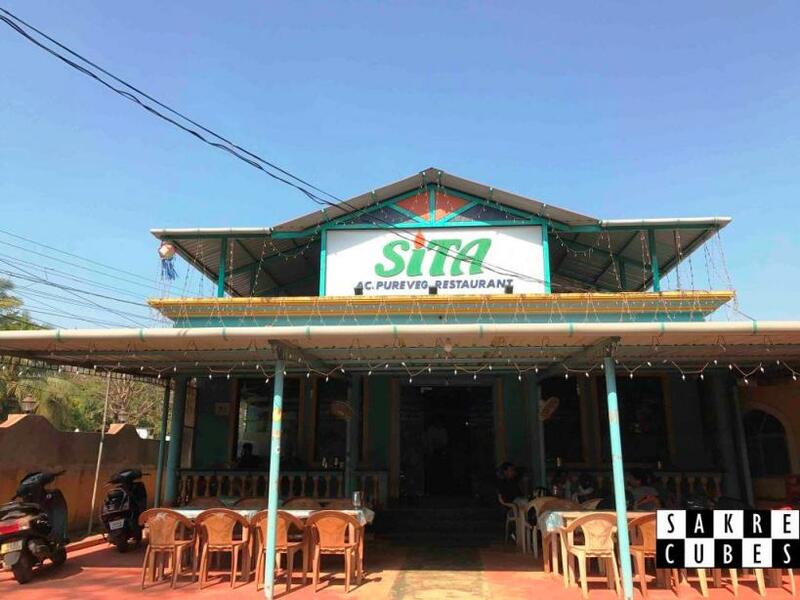 We finally found a restaurant called Sita just half a km before our stay. Even though the food was bad we had to admire it because it was the only restaurant serving breakfast on the entire 45 km stretch. We reached our stay at 11.10 in the morning but the usual check-in times were 12 pm. After negotiating with the hotel manager he allowed us to check in at 11.30. The rooms were not that good, nothing like the one showed in the images :@ Half an hour later we were all ready and set to rock the Goan beaches. 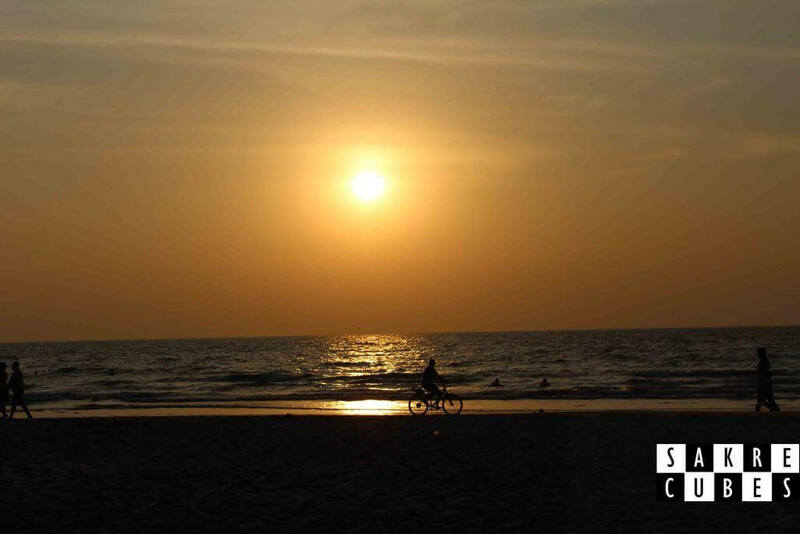 The plan was to visit Calangute and Baga beach for water sports, have lunch at Ashwem beach, watch the sunset from Chapora Fort and have dinner at Anjuna Beach. Caught by the Police: We left our stay at 12.15 in the afternoon. 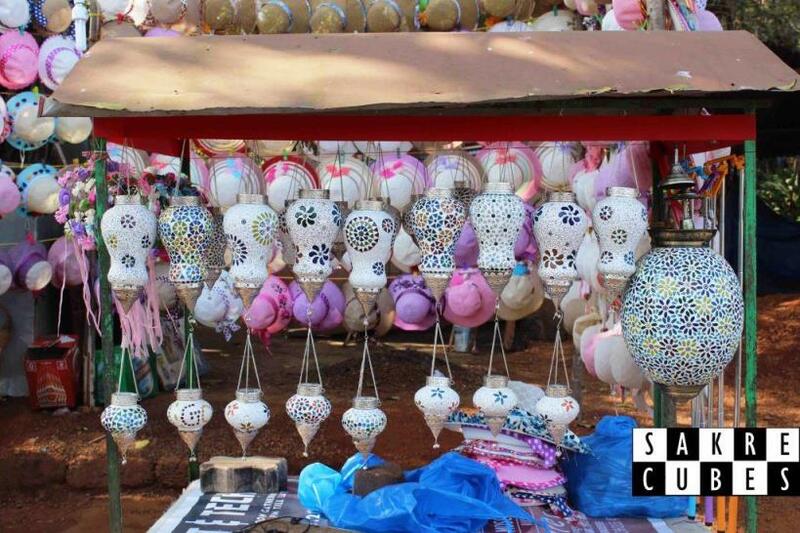 The first stop of the day - Calangute was 10 km from away. Half the way we were pulled over by the Goan cops for not wearing a helmet. 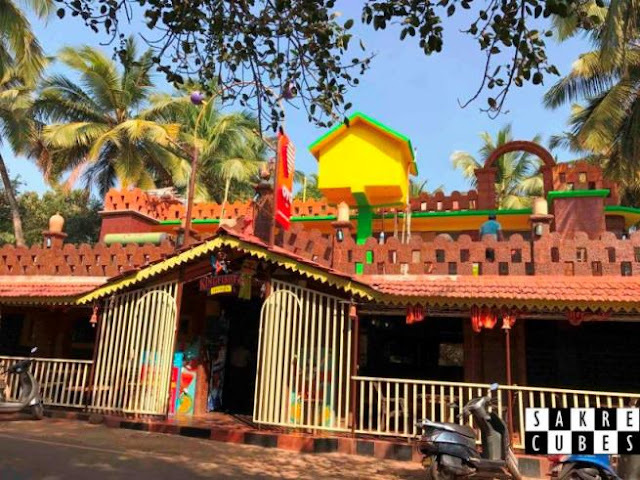 We had underestimated the Goan law and thought there are no strict rules here. Fortunately, the police were kind enough to let us go without imposing any fine. We came back to the hotel and picked up helmets and license. Cops will be there on the main roads so don't forget to wear the helmet and carry license, they even check for Drink and drive. 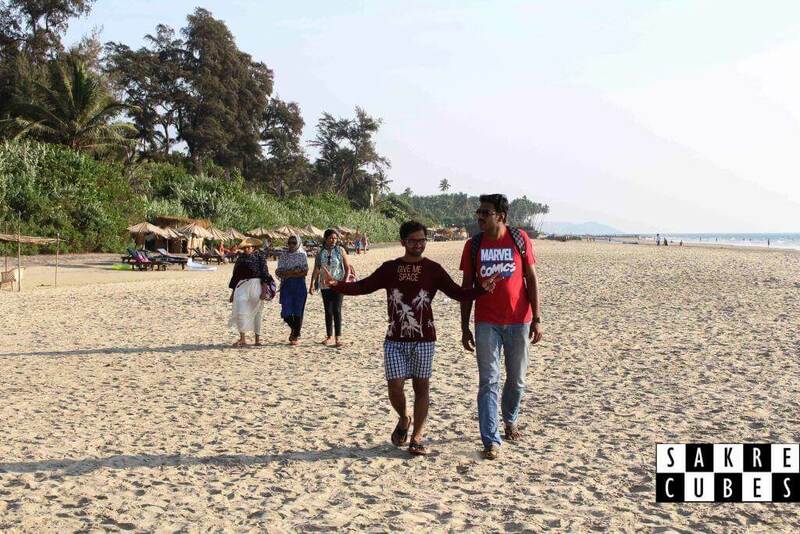 After all the drama we reached Calangute Beach at 1 in the afternoon. As soon as we parked our bikes, we were hogged by people selling water sports packages. Watersports are expensive especially during peak season, but it's a must do in Goa. We tried to bargain on the prices but seems like they have a fixed package and they won't reduce even a single penny. We decided to do Parasailing, Jet ski and Banana ride for Rs 1400. 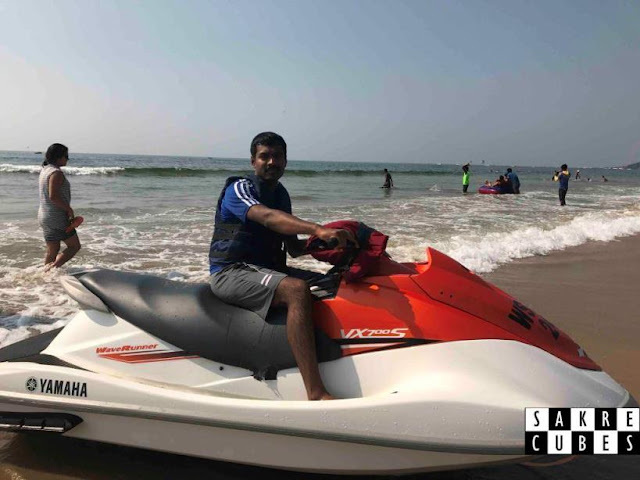 Watersports: If you are found of Jetski then they offer a 4 km ride for 1500 Rs, where you can ride for the entire stretch on your own. We opted for a short 200-meter ride for 300 Rs but the guide himself will ride the Jetski and we have to be pillion rider. Jetski: I had underestimated the Jetski until I sat on one. I never knew these motors could be that powerful. After going 200 meters into the sea the guide offered to let me ride the Jetski and go some extra distance at an additional 200 bucks. I realized his marketing strategy and denied the offer. 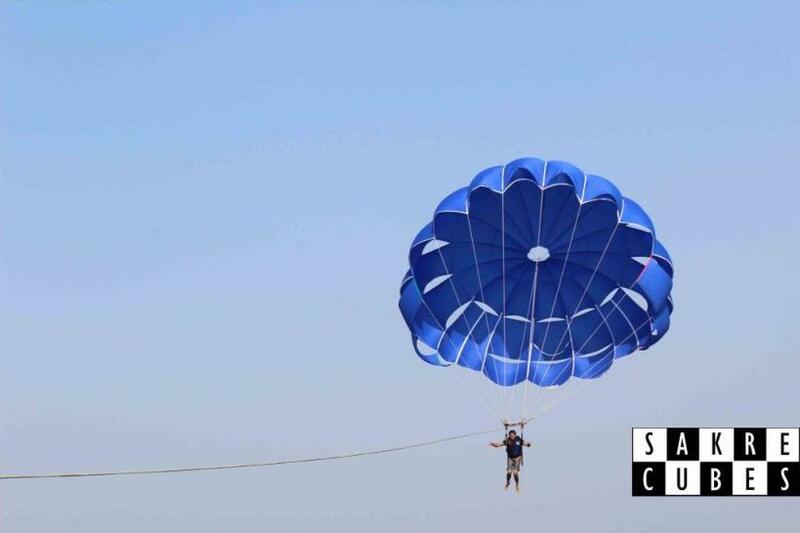 Parasailing: We then moved to the Parasailing where we boarded a speed boat with Parasailing equipment fitted. One after other we did parasailing. It was my first time doing this and I totally enjoyed it. I was up in the sky for more than 300 feet from where I could see the entire beach and the ocean spreading till the horizon. 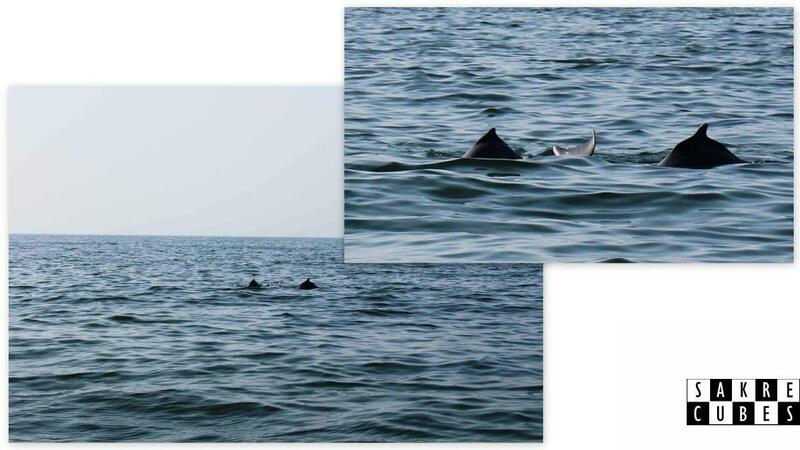 After everyone was done the guide told us he will show us Dolphins for Rs. 100/head. There were totally 10 people on the boat but no one agreed. He reduced the price to 50. Yet no one agreed. Then he reduced to Rs25/head and begged that this is the least amount he can offer. I thought it was a great deal and I agreed. So did everyone in the boat. The guide asked us to turn around and there were Dolphins playing in the water. Immediately everyone realized that we got fooled and I was the culprit. Can you see the Dolphins there? 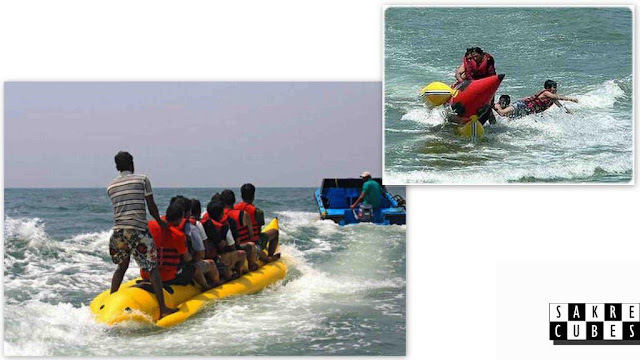 The last watersport was the Banana ride where all 6 of us hopped on a Banana shaped boat. 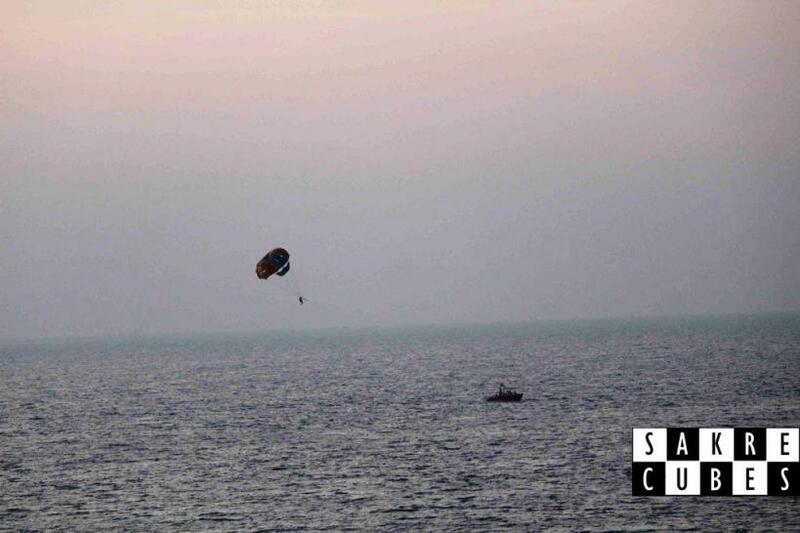 They took us into the sea and all of a sudden tilted it which made us fall into the water. No one knew what was gonna happen so it was a thrilling experience. Meanwhile, Vinay got injured as the guide's leg hit him hard on his head while we were going into the water. There were no external injuries but Vinay was feeling extreme pain. We suspected that it could be an internal injury and realized we should consult a doctor as soon as possible. Surprisingly there were no hospitals nearby. Google maps gave up on us, locals also didn't help much. After searching a lot we finally found a multispeciality hospital near our hotel. The doctor said there's no injury but suggested to get the MRI scanning done. 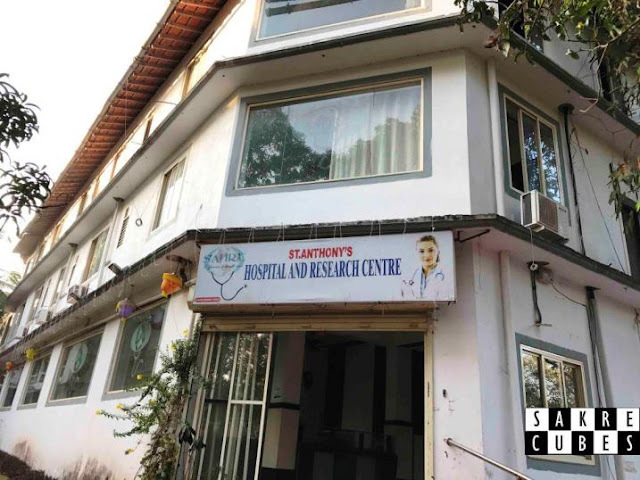 There was no scanning facility at this hospital and the closest scanning lab was in Panjim. The doctor gave painkiller and asked not to booze or have spicy food. Things were going so good but suddenly the incidence like this gave a shock to everyone. Vinay was courageous enough to handle the pain. None of us had anything since the bad breakfast in the morning. 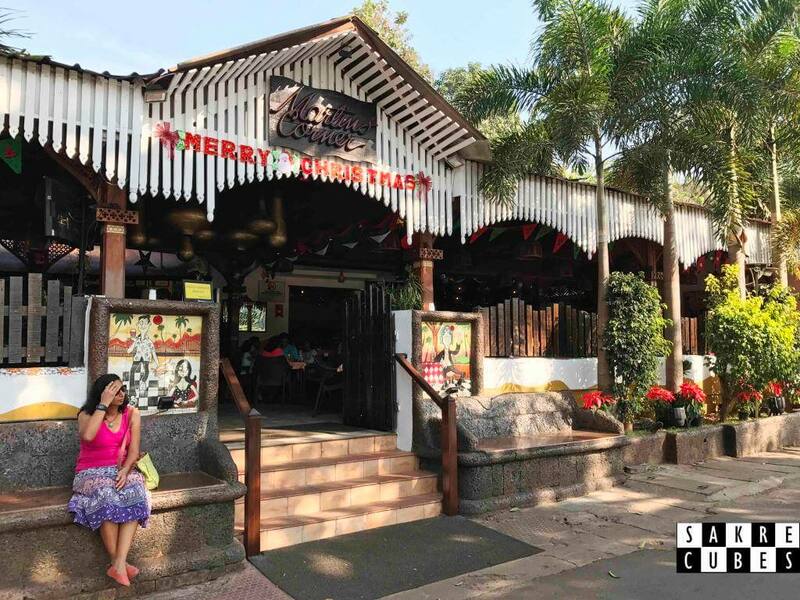 We decided to directly go to the Curly's restaurant at Anjuna beach for the dinner. 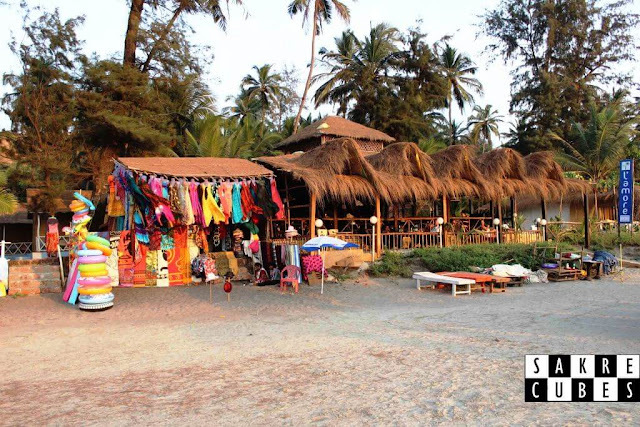 Curlies Beach Shack, Anjuna Beach: We got freshen up and headed to Anjuna beach for the dinner at 730. 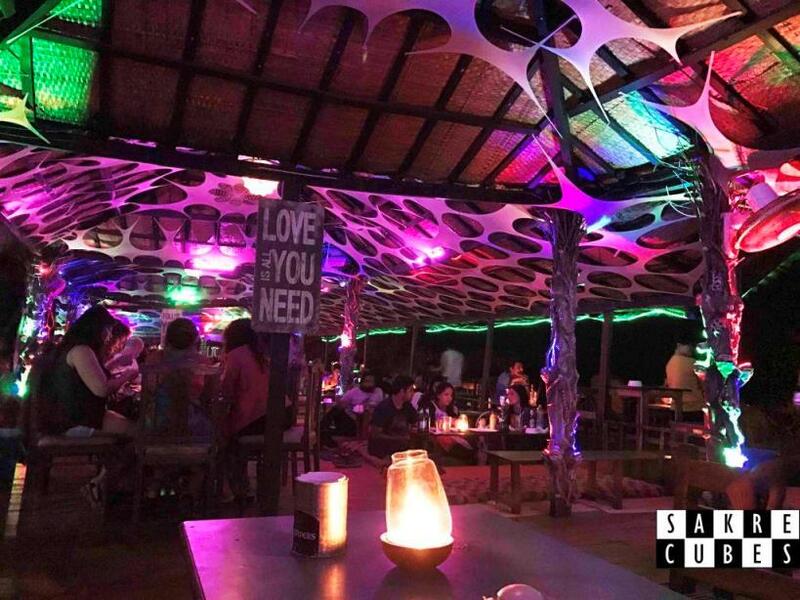 Curlies Shack is one of the hotspots for night party. 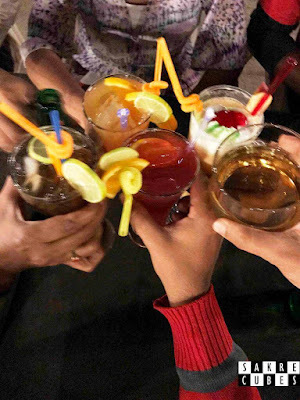 The dance floor was free for couples and charged Rs 500 for the stag. The food was really good and the ambience was great. After dinner, we came to the beach and walked for a while. The beach is very good at this place than it was at Calangute. 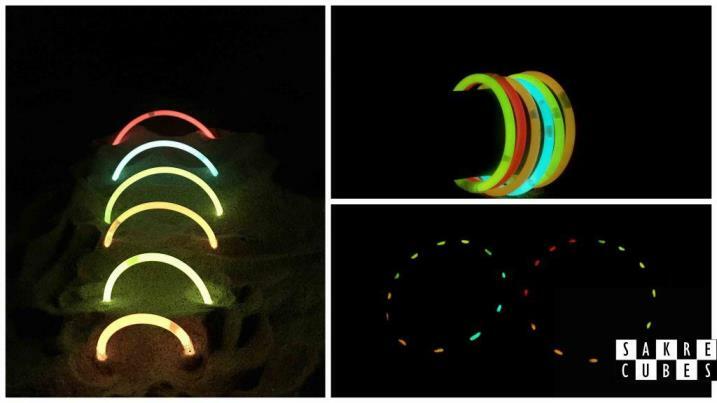 We sat on the beach and spent next couple of hours discussing our old days. We didn't realize when it was 1 in the night already. It was bone freezing cold and none of us had a jacket. Off course who wears a jacket to the beach right? 15 minutes of ride to the hotel felt like a light year long in the cold like this. It was a little spooky to ride at midnight especially as we had girls in our group. We reached our rooms and crashed on the bed.